Solid oxide fuel cells have a problem; the integrity of the seals within and between the power-producing units tends to fail. The stack materials run at high temperatures in some designs as high as 1000 degrees centigrade (1,800 F). Keeping the fuel separated is critical as a fuel leak into the oxygen side can cause combustion. That’s a nerve-wracking problem, free O2 and a fuel inside a high temperature unit, so seals have to get much better. Current solid oxide fuel cells are made of ceramic materials and use the high temperature to separate oxygen ions from air. The ions pass through a crystal lattice and oxidize a fuel, usually a hydrocarbon. The chemical reaction produces the desired electrons, creating electricity, which then flows through an external circuit, doing the needed work. 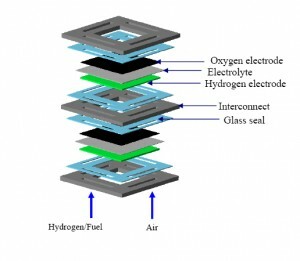 When solid oxide fuel cells are operated in reverse mode as solid oxide electrolyzer cells, pure hydrogen can be generated by splitting water. Solid Oxide Fuel Cell Diagram. Click image for more info. To produce enough current solid oxide fuel cells modules are stacked together. Each module has air on one side and a fuel on the other side and produces electrons. Many modules are stacked together to produce enough power for the specific application. Each of the module’s compartments must be sealed, and there must be seals between the modules in a stack so that air and fuel do not leak or mix that can result in a loss of efficiency or the dreaded internal combustion. Peizhen (Kathy) Lu, assistant professor of materials science and engineering at Virginia Tech has a solution. Lu has invented a new glass that can be used to seal the modules and the stack. The self-healing seal glass will provide strength and long-term stability to the stack. The research is based in the hope of developing solid oxide elecrolyzer cells. Backed by the U.S. Department of Energy Lu has used funds now past $365,000 so far. Lu says, “For solid oxide fuel cells to run, we need to have a fuel. Hydrogen is the cleanest fuel you can ever have since the by-product is water. However, there is no abundant source of hydrogen and it has to be made. The solid oxide elecrolyzer cell process for splitting water into hydrogen and oxygen is one very desirable way of doing it.” But it looks like Lu’s work is one of those research efforts to have an unanticipated result, a much better fuel cell perhaps using methanol or ethanol fuels that can be sourced from renewable biomass or others like methane, ethane or perhaps propane. Lu with Her Students. Click image for more info. Lu’s work is based on a team effort whose earlier effort relates to this result. With Virginia Tech materials science and engineering doctoral student M. K. Mahapatra of Egra, Purba Medinipur, India, Lu published “Network Structure and Thermal Stability Study of High Temperature Seal Glass,” in the Oct. 6, 2008 issue of the Journal of Applied Physics. While a motivator from the hydrogen economy seems important to the funding, the results have major implications for much more practical applications. Its far better to use hydrogen bound with carbon than to try to use it alone, at least so far. The anti-carbon thing is based in the anti-fossil fuel psychology and gets more feeding from the global warming hysterics. But carbon may well turn out to be the ultimate hydrogen storage medium, so Lu’s work may turn out to be very important from a practical point of view in a developing fuel economy based on carbon. Serendipity, I would say, and grateful for the work and the reporting of it.